Combine first 3 ingredients; add 1/4 teaspoon salt, stirring with a whisk. Heat a 10-inch ovenproof skillet over medium-high heat. Add 2 teaspoons oil; swirl to coat. Add mushrooms and remaining 1/4 teaspoon salt; sauté 6 minutes or until mushrooms brown and most of liquid evaporates. Stir in onions; sauté 2 minutes. Reduce heat to medium. Add egg mixture and basil to pan, stirring gently to evenly distribute vegetable mixture; cook 5 minutes or until eggs are partially set. Place pan in oven. Bake at 350° for 7 minutes or until eggs are cooked through and top is lightly browned. Remove pan from oven; let stand 5 minutes. Run a spatula around edge and under frittata to loosen from pan; slide frittata onto a plate or cutting board. 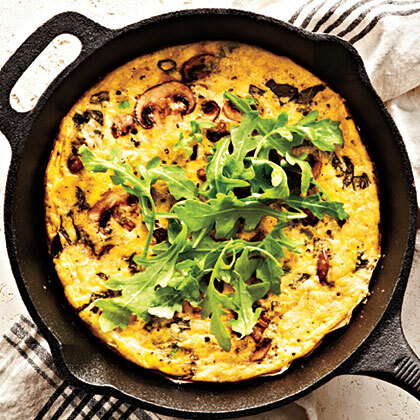 This entry was posted in Modified Profast (Fast and Flexible) Recipes, Nutriplus Recipes (Balance Your Pyramid) and tagged arugula, breakfast, easy, eggs, frittata, mushrooms, one dish by foodies4mmc. Bookmark the permalink.